salt & black salt to taste. the veggies also should be chopped in square shapes. Cut broccoli in medium pieces. keep the chopped veggies and paneer aside. add ginger garlic paste and all the spice powders plus ajwain, including black salt. mix the spice powders with the curd. you could also add ½ tsp oil. add the veggies and paneer to the marinade. marinate for atleast 2 hours or more. 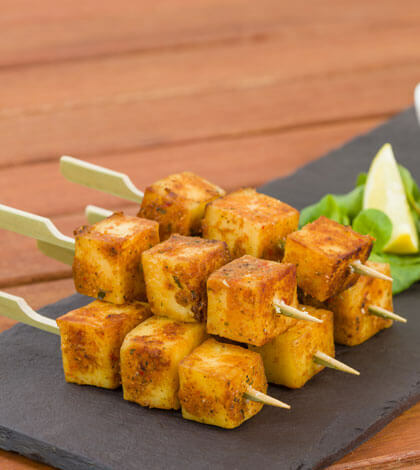 skewer the veggies and paneer alternately on skewers or kabab sticks. preheat the oven for 3 minutes at 180 degree celsius. brush some oil on the veggies and paneer. after 10 remove the skewers, and turn the skewers. keep again in the oven and bake for a further 10-15 more. sprinkle some chaat masala on paneer tikka. serve the yummy panner tikka with mint chutney and onion rings with lemon wedges.